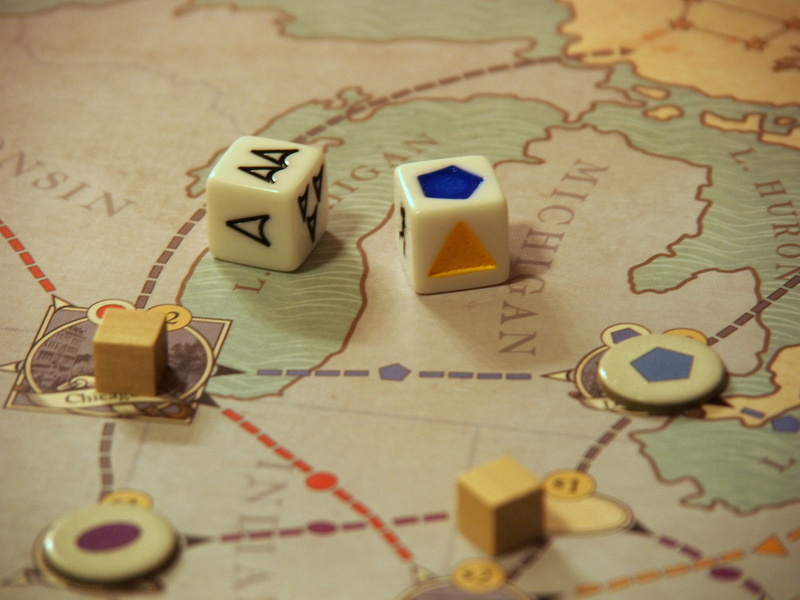 A slew of new viking-themed games have pillaged our wallets these past few years, allowing gamers to do everything from tracking actions on a rondel in "Vikings" to building wacky decks in "Vikings Gone Wild" to attacking (or defending) what became the British homeland in "878: Vikings – Invasions of England." In 2017, "Raiders of the North Sea" put a different kind of worker-placement spin on the viking story and – after a successful Kickstarter project where it raised over $100,000 – the game found itself nominated for the prestigious Kennerspiel Des Jahres. It ended up losing to "Exit: The Game," but the committee did itself a service by picking this one as a finalist. I've played Raiders a half-dozen times now – with 2, 3, and 4 players – and can say that it's my new favorite worker-placement game. Just don't let the expansion bloat tempt you do go too far. I'll try to keep the rules summary to a minimum, but some concept of what happens in the game is important before we continue. Everyone starts with one black worker and a hand of three crew cards (these can be randomly distributed, or drafted once players know how things work) and some money. 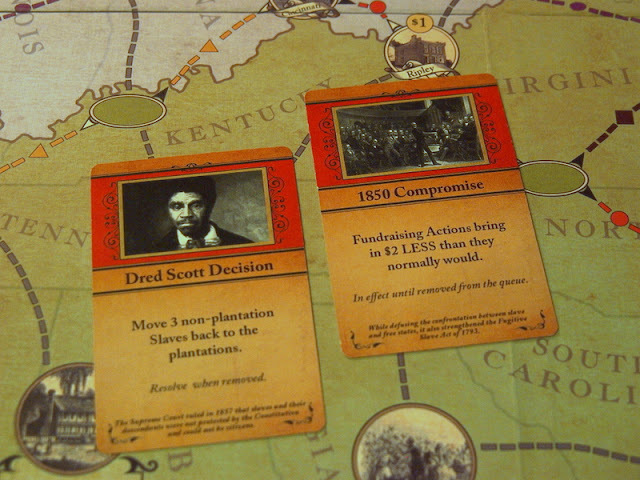 At the beginning fo the game you can only take actions (called "work" in the game) on the action spaces south of the river on the nicely illustrated game board. Once you've collected enough items and hired enough crew members, you can get on your virtual ship and start attacking locations to the north (the "raid" action). The harbors are the easiest to attack, the fortresses the most difficult. But even if you don't have enough strength (made up of your crew, your level on the armor track, and, sometimes, the results of a die or two) to fully conquer a raiding space, you can still attack a difficult location to get the resources. You just won't get any points for that raid. Learning to identify the situations when this sort of move makes sense (as a defense against an opponent who's about to score a lot there, or to collect resources and then turn them in for one of the offering tiles) is a key to playing Raiders of the North Sea well. You keep on taking the "work" and "raid" actions as you build up your crew – sometimes watching them perish and go to Valhalla (where they stop being useful to your attacks but go gain you end game points as befitting a Viking warrior) – until one of the end-game triggers is reached. In my experience, this is usually when 5 of the 6 fortresses has been raided. Count up the points (available from a Feldian variety of choices, especially when using the expansions), and call it a good day. On way that Raiders' differentiates itself from other worker-placement games is that it has three kinds of workers. Black, grey, and white pawns function generally the same (put them onto or take them off or a space to do that action), but some spaces are off-limits to pawns of a certain color and some spaces function differently depending on the color of the pawn you use there. Black workers, for example, get three coins at the silversmith, while grey and white workers only get two. You can't access the grey or white pawns until someone accomplishes a raid, and even then the person making the raid can't claim ownership of that worker forever. Instead, she will place it somewhere on her next turn, perhaps allowing another player to remove it from the board as one of their actions. It will become theirs for a turn, and the cycle continues. 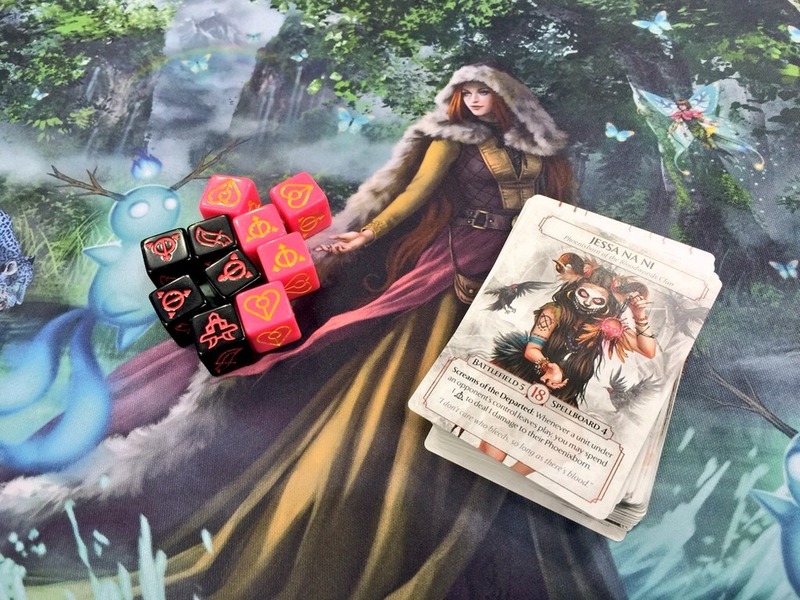 Two beautiful expansions – Hall of Heroes and Fields of Fame – both introduce new elements without in any way overwhelming the players with choices. In short, Hall of Heroes introduces mead and a way to get your crew drunk so they will fight better on a raid, as well as Quest tiles I've played one game with both added in and that combination did feel a bit busy, but the players who had previously played with the base game and one expansion did not need much time to figure out how to integrate everything into one cohesive whole. Based on watching players who were trying the game itself for the first time wrapping their heads around the multiple paths to victory the expansions offer, it's fairly clear that the base game by itself is the right way to introduce people to the game. Maybe that's obvious, but it bears saying. Raiders is a friendly worker-placement game because you can't ever get totally blocked from taking an action that you want or need to take. The "place a worker, take a worker" mechanic nicely changes the tension found in other worker placement games to something more like an annoyance. Since you have to place your in-hand worker onto an open space and then remove another worker from a different action space means that the order of your actions is determined by the board state when your turn rolls around, but you can still do anything you want. Raiding locations, on the other hand, can be blocked so speed is still an important factor in winning the game. Well, most of the time. There is no rule that you can't have two of the same townsfolk in your crew, which might work fine in the base game, but I discovered in a game with three players and the Hall of Heroes expansion that some combinations can simply reach the win faster than others. In our example, one player had two Gatekeepers, which each allowed him to draw an extra card at the Gate House. So, instead of getting two cards a turn, he was getting four. This, in combination with the Quests that Hall of Heroes introduces meant that he was able to scoop up a seemingly endless pile of Quest tiles and thus ran away with the game. The rules might not need to be changed, but players should pay extra close attention to anyone who has a pair of crew members who offer the same benefit. While the two expansions to add component for an additional player each. Beyond adding new color choices, I think these components are fairly useless. Raiders is already a bit slow and works much better with a group that is familiar with the rules and can take their turns quickly. I haven't played with more than four, but just imagining the wait for five people to take their turns before I get to do it again is exactly the invitation I need to play a different game. Perhaps another item in the North Sea saga, like Explorers of the North Sea or Shipwrights of the North Sea. Game author Shem Phillips has even released The North Sea Runesaga, which is a campaign that ties all three games together to crown the ultimate Viking chieftain. It's notable that this campaign is only for 2-4 players, a subtle way of reminding you that this is how things were originally designed. That's one of Raiders Of The North Sea's strongest points, that everything feels intentional. The artwork on the expansion boards fit nicely next to the base game. The expansion mechanics feel like logical extensions to what came before. The promo cards I have for the game mesh nicely with the standard cards. 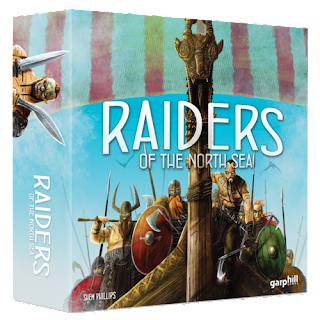 But, if there's one aspect where Raiders of the North Sea deserves criticism, it is in its excessive number of limited-edition promotional cards. Currently, there are a half dozen or so out there, and some of them are outrageously expensive. I understand that some of these promo cards are intended to be fundraisers for the sites that are selling them (like the Rod & Pep promo for Watch It Played), but paying $20 plus shipping for a few cards just feels crazy. Other than some expansion and promo craziness, Raiders Of The North Sea is an excellent addition to the viking board game category. Simple without being simplistic, clever without being overdone, and pretty without losing functionality. This review originally appeared in The Spirit Of Games And Gamers, Summer 2018 issue. Dominion kicked off the deck-builder genre with a fire that still burns brightly in the hearts of game designers everywhere. This fire is so strong that there's a case to be made that a fair number of the deck-builders that have built on the basic Dominion framework should come with a special "Hey, you've played Dominion, right?" rulebook that only describes the gameplay differences between the current game and the granddaddy to get you up and running in a hurry. For Vikings Gone Wild, that ruleset would say: this is Dominion with a lot of bling. You still draw five cards, you still have "blue" defense cards (but they don't work the same), and the buildings are like orange duration cards. Oh, and there's an Ascension/Star Realms-like row of cards called Odin's Path that flows throughout the game and there are two resource types, sort of like potions, but there from the beginning. You can also attack other players directly, but with minimal damage to them, and there's some incredibly bright cartoon vikings who love them some beer and gold. As that intro might be give away, if you like Dominion you will at least get some enjoyment out of Vikings Gone Wild. I love Dominion, and have played it well over 200 times. I've played Vikings Gone Wild a half-dozen times now, and while I don't think I'll ever like it as much as the elegant original, I'm glad I bought it and have it as an alternative. Perhaps holding this new entry up to the first deck-builder isn't fair, but it is absolutely inevitable. And that's sort of how I taught the game to the people I played with: it's Dominion, with some other stuff. What that other stuff was depended on if I was playing with any of the game's three official existing expansions or not. There's a fourth one, made up of the Kickstarter mini-expansion that came with the crowdfunded copies of the base game, that will become available again when an all-new, fifth expansion, hits Kickstarter in August. 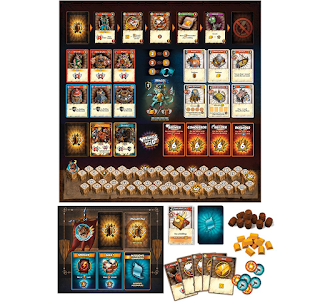 Using only cards from the base game is a fine way to learn Vikings Gone Wild, but if you've played other deck building games, I imagine you'll get bored with this set up pretty quick. The base game has just enough type of building, defense, and unit cards to fill up the required slots (six, three, and three, respectively) that are needed in every game. The order of the Odin's Path cards, which change every turn, as well as the mission, end-game bonus scoring and divine flavor cards, will change from game to game, but even here, you'll see every kind of card after like two plays. In other words, you'll want the variety that the Guild Wars and It's A Kind Of Magic expansions offer. Ragnarok, maybe or maybe not. More on that below. Let's get back to learning the game. A round begins with each player generating resources (beer and/or gold) from their production buildings and then drawing five cards. Then, each player plays their turn in order (start player shifts to the left each round). Importantly, you do not draw a fresh hand of cards when you're done playing. Not yet. This way, you can keep defense cards or bluff that you're doing so. You'll want to do this after the first few rounds because you can be attacked on other people's turns, and surprising them with a higher-than-expected defense can not only score you some points, but also seriously weaken their attack strategy. Because that's another way Vikings Gone Wild is different from Dominion: points are tracked on the board, not with green cards in your deck, and attacking is a great way to score a lot of points. Three successful attacks in one turn will get you a minimum of five points, and maybe eight or 10. In a 3-4 player game, the end is triggered when someone hits 30 points (40 in a two-player game), so multiple attacks in a turn hastens the end of the game in a big way. The good news for people who don't like PVP strikes is that the only thing that being attacked does is it can make you lose a resource. Your buildings still work just fine and you don't lose any points, so if you don't ever get any defense cards, you won't get hurt directly, but the game may be over before you have your engine up and running. Other than attacking another player (which means playing unit cards with attack values equal or higher than the defense value printed on someone else's building), you can spend beer or gold cards (or produced goods) to buy better cards. Maybe you want stronger units to attack in a later turn, or maybe some better buildings to put in town so you can draw more cards at the start of your turn with a Tavern or hold some beer between turns with a Beer Container. You can also complete one mission a turn, and this it the most common way of scoring the first few points in the game, which allows you to (at five points) snag your first Divine Favor card. As the game goes on, your turns get more and more powerful (no surprise to Dominion players) until someone triggers the end. Instead of attacking with two strength, you can maybe get six or seven. Instead of buying one cheap card, you can get a medium-cost card and a big one, like a Pigator. If you're not using any expansion cards, you can't "trash" any cards, so you're stuck with your weak starter cards all game. This means that cards that let you draw more cards are vital to creating powerful turns. At the end of the game, four special scoring cards are evaluated, and these are important to keep in mind all game. The 24 points they offer can easily move the last place player into first. These end-of-game goals are drawn randomly each game, and this is the main variety that the base game offers if you don't have any expansions. Oh, and about that Pigator. The theme from Vikings Gone Wild comes from an apparently popular smart phone app. I've never played that game, but my guess is that it's colorful and light and I assume the vikings go wild there, too. The two standard expansions available now introduce more cards and card types, as well as tokens that can manipulate defense values or your units' strength. 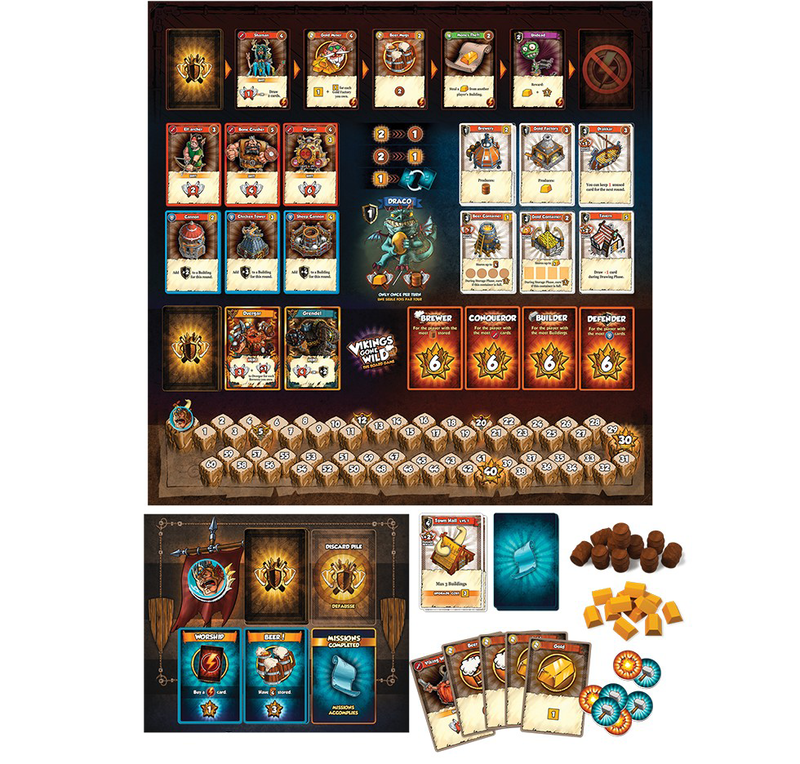 There are also 2 vs 2 team rules and, in the biggest twist to the standard game play, the smaller Ragnarok expansion removes the Odin's Path cards and replaces them with a never-ending stream of evil vikings from an Undead Army intent on attacking you. Now, instead of trying to score points, you're trying to defeat the minions and then a big boss. I really don't know if I played my first solo game right, because I couldn't find anything that said my city hall building couldn't be used to block attackers, and it seemed almost too easy when it did. The boss I faced was Dark Thor, and the objectives (end-of-game goals kind of like you use in the standard game, but focused on solo/cooperative play) were Reconstruction and No Shortage. These two certainly guided my strategy to focus on buildings and producing gold, which meant I had lots of gold, which in turn made buying Taverns easier, which dovetailed nicely with making enemies that much easier to defeat. As you would expect from a deck builder, drawing more cards at the start of your turn is, in fact, a helpful thing. I only bought one defense card (a single Cannon), which ended up not being a huge deal one way or the other. Maybe next time, I'll have to choose a tougher difficulty level, see how that plays out. 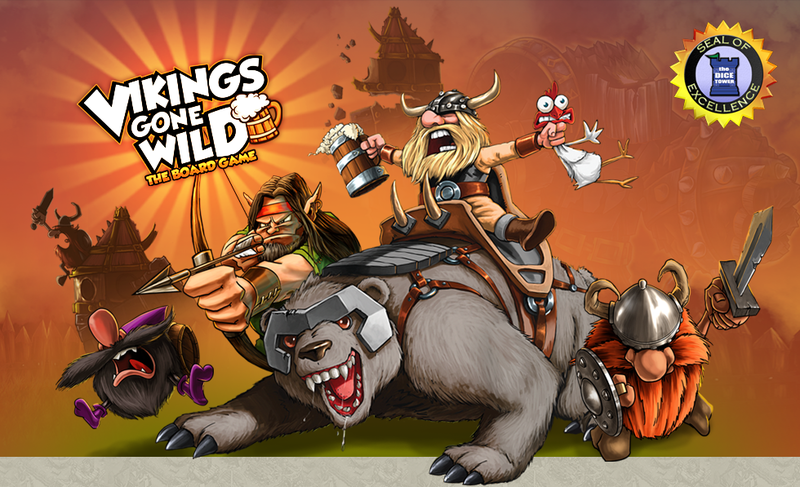 So, yeah, Vikings Gone Wild is a fun little game. It's not Dominion, but that might be a good thing for some people. In the long term, I'm pretty sure I'll prefer the clean elegance of the first deck-builder. But now and again, I'll be more than happy to go see what those Vikings are up to. Once reason I may not play it as much because the cards are unfortunately quite thin and, after just a few plays, are already showing signs of wear. I'm not sure this is a game I want to invest in sleeves for, but if I want to keep it in playable condition, I guess I'll have to. Sigh. This hobby sure is fun, but it can get expensive when you're playing with vikings. *This article originally appeared in Counter magazine, issue 77, September 2017. So, you wanna go to Origins? Or maybe Gen Con? Let's compare the two. Considering that the whole purpose was to play board games, I sure did pay a lot of attention to the food. It used to be, when I went to Origins Game Fair or Gen Con, I would get incredibly excited about the culinary options that presented themselves in between rounds of my favorite games and roaming the dealer hall for prizes. That’s why, for years, Origins was my favorite of the two big US gaming events because the Columbus Convention Center was right next to the North Market. Located just a block away, this market has so many amazing foods - Jeni’s ice cream, Indian curries, excellently prepared meats, local fruits and veggies - that you’ll want to buy your badge for next year’s Origins before you leave town. But then Gen Con decided that maybe an overpriced food court and a bunch of chain restaurants in downtown Indianapolis were not enough for tens of thousands of hungry gamers. That’s when the food trucks started showing up. And so now, based on delicious calorie choices, Origins and Gen Con as basically a wash these days. Both now let you eat lots of interesting and unusual foods, so, if we want to compare the two conventions - and in this article I do, for anyone who’s been thinking of attending one or the other and could use help deciding which one to go to - we’ll have to do it based on the actual gaming opportunities. This is where Origins and Gen Con are the same but different. I’ve been going to both for the past 7-8 years, and in that time, they’re only been held in the cities where they will be held again in 2016. The long history of these two cons takes them from the shores of Lake Geneva to Ann Arbor to many other cities. But this isn’t a look back. I’m more interested in trying to help you pick between the two for the future, and maybe offer a few tips to old-timers who think they’ve seen it all. As far as the numbers go, Gen Con is going to mop the floor with Origins every time, but that doesn’t mean that Origins isn’t worth going to. 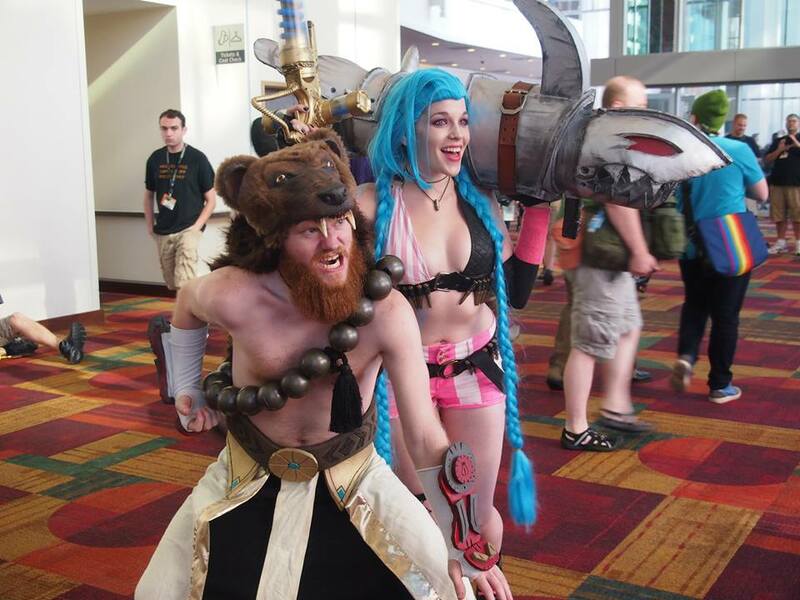 In 2015, Gen Con had over 61,000 people, more than twice as many as came in 2010. Origins, on the other hand, saw almost 16,000 attendees last year, up from the 10,000 or so who were there in 2010. You can probably guess that those numbers mean that everything’s bigger - but not necessarily better - in Indianapolis. More people means a more crowded dealer hall. More people means more costumes. More people means more events. In fact, while there will be over 4,500 events at Origins 2016 and probably over 13,000 at Gen Con (numbers for 2016 are not yet available, but that’s how many took place last year). The incredible number of people who cram into the Indiana Convention Center for Gen Con each year means that, if you’re willing to put the effort in, you will be able to play whatever game you want there. From the newest and hottest release to some 30-year-old classic that takes two days to play, you will find your tribe at Gen Con. In my experience, if you’ve got an old, perhaps out-of-print game you’re just dying to get to the table again, Gen Con is a much better bet. One of my all-time favorites is the Star Wars CCG, the one made by Decipher from 1995-2001. Since then, fans have kept the game alive, but it’s been a challenge for me to find people to play with these last few years. Thankfully, at Gen Con, I know there will always be at least one tournament, and the one I played in last year was a build-a-deck-right-before-you-play cube event, so I didn’t have to worry about the current state of the metagame to play again. It was glorious. I have also been able to play some of my other old favorites – like Anachronism and the Lord of the Rings LCG – at Gen Con without too much hassle. I’ve found opponents through the BGG forums ahead of time but, once, I saw someone buying old Anachronism packs in the dealer hall and asked him if he liked the game. He said he didn’t know it and that it was sort of an impulse buy, so we immediately found a table and I taught him over a few fun, short games. This sort of thing is easier at Gen Con, but could happen at Origins, too. This brings me to the dealers. You’ll find way more to spend your hard-earned money on at either Origins or Gen Con than is sensible for any logical person, and somehow I always manage to drive home with more than I intended to buy. Most game companies plan to have their (hopefully) hot new release available at Gen Con, but a few will prepare new games for Origins as well. I’ve learned that the amount of time it takes to rush to the dealer booths that are selling the most popular games, the time it takes to wait in line, and then the disappointment that results when the game you want is sold out is just not worth it to me. 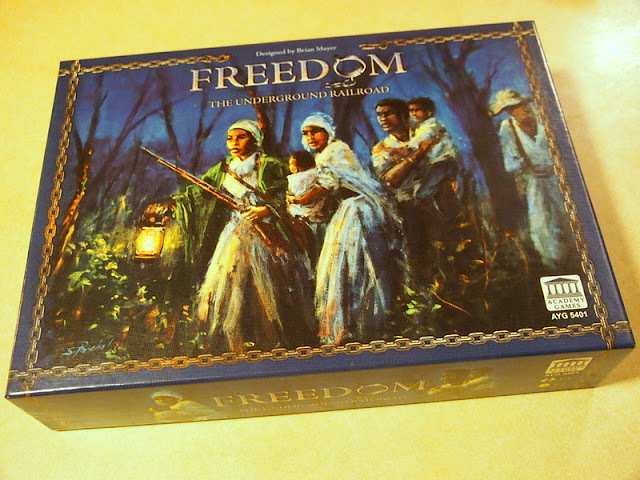 I’m happy for everyone who likes to track down the games they simply must have as soon as they’re released at Gen Con, but since the good ones will hit general distribution at some point - even if it means waiting a few months - the better choice for me is to just pass on all the rush and spend more time gaming while I’m on site. 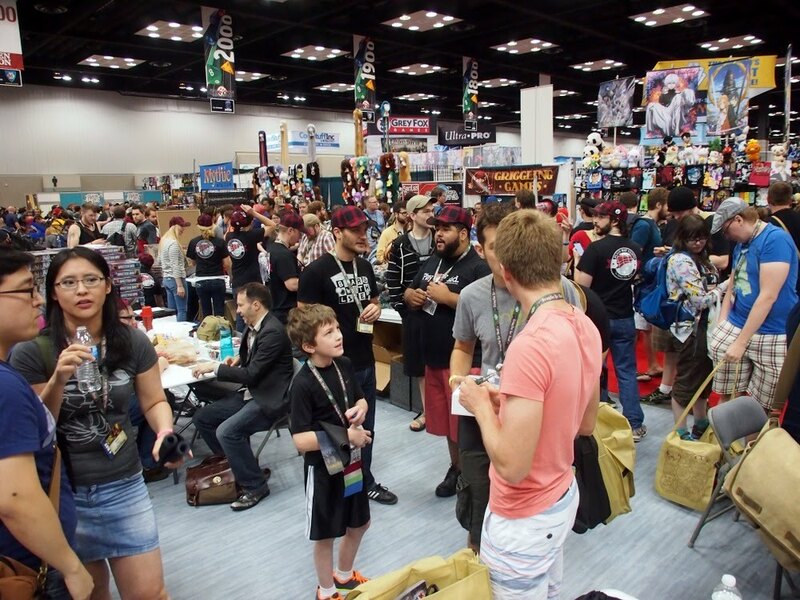 Both Origins and Gen Con will offer you high-caliber tournaments for any number of games, but there’s no question that there will be more happening in Indianapolis. Fantasy Flight Games, for example, is hosting massive tournaments for its tournament-level games (things like Netrunner and Star Wars: Imperial Assault) at both cons, with the one in Ohio called the US Nationals Championship and the Indiana one being the North American Championship. 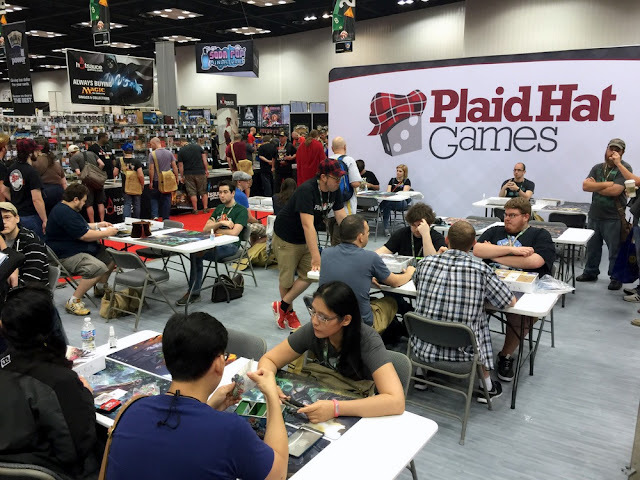 Not every company is going to devote this many resources to hosting two big tournaments, so if you’re into tough challenges, then you’ll want to pack your bags for Gen Con. I happen to like the more relaxed feel that Origins offers and the open board game room (well, open once you buy the ribbon/pass) has been a favorite place to learn new games and sometimes be able to get a few free ones. The open board gaming in the Rio Grande and Mayfair rooms are also great places to hang out in the evenings, and they’re usually available at both cons. The standard badge price for Gen Con is $75, while Origins is $65. Both have various discounts available for early birds and children and other special cases. If you want to get in for free, I can heartily recommend volunteering with your favorite game company as a booth monkey. I’m sure there’s a better name for these helpful people, but when I volunteered many years ago, I thought that booth monkey was a good a term as any. Depending on the company and the number of hours you help teach their games, you can usually score a free badge and maybe a bed in a shared hotel room. It’s not the easiest job in the world (running through the rules for the same game over and over for four days does wear on the nerves a bit), but it is a cool, low-cost way to explore the universe of a big game convention. If you want to explore the things that happen outside of these convention halls, then I can easily recommend the convention-adjacent areas of Columbus over Indianapolis. Aside from the easy-access food at the North Market, Columbus has the Short North, a street full of quirky shops and restaurants. It used to be that Origins happened on the same weekend as ComFest, a wonderfully weird celebration of local music and community that happened at Goodale Park, just a few blocks away from the Convention Center. With Origins moving its dates around recently, the two events don’t take place at the same time any more, but they might align again soon. For the past two years, there’s been a different sort of counterculture event that happened at the same time as Origins: a “bare as you dare” naked bike ride. The date for 2016 has not yet been set, but it wouldn’t hurt to step out onto High Street Saturday evening at maybe 10 pm, just to see if a few hundred mostly naked people will be riding by. You won’t see that in Indianapolis. When I go to these conventions, I usually stay with friends, so I’m not that familiar with the hotels in either Columbus or Indianapolis, but I do know that if you haven’t booked a hotel by now, you’re probably not going to be staying anywhere close to the convention center. Those rooms get snapped up real quick. So, I’ll just give you my advice for how to move around the two downtowns. Parking is easier and cheaper at Origins than it is at Gen Con, but since 2015, Indianapolis has a great new carsharing option called BlueIndy. After you get yourself a short-term membership, you can drive these electric rental cars from near your hotel towards downtown, park for free and just walk away from the car. When you’re ready to go back, look at the app on your smartphone to see where the nearest available car is and hop in. I got to test this out last year, and it should work great for Gen Con attendees who don’t want to bother with bringing their own car. Of course, if you’re going to be buying heaps of games, maybe it’s worth it to have your own trunk to put things throughout the day. Oh, and one more thing about the food choices in Columbus and Indianapolis. The lines are shorter at the North Market than they are at the food trucks. If you still haven’t made up your mind which one to go to, there’s your tie-breaker right there. In the end, there’s no wrong choice here. If you want to get yourself neck-deep in board gaming, then you’ll have fun no matter which event you go to. Pretty soon, you’ll end up going to both of them, like so many others. It’s a good life. *This article originally appeared in Counter magazine, issue 72, April 2016. I had no intention on spending $50 on a card game I had never heard of. I have way, way too many card games already. I have too many because I love card games. Big ones, little ones, complicated ones, simple ones. I don’t care. If it’s an elegant design, I’m interested. I love Skat, a German game for three that’s played with just 32 cards culled from a standard deck just as much as I love the old Star Wars CCG, which has almost 2,000 unique cards. I even have a number of card games that sure look interesting, but I’ve never played them. Walking into GenCon 2015, I certainly didn’t think that there was yet another brand new card game out there that was going to take my money. Guess what? I now own one more card game. The box art was the first thing. It's bold, elegant and attractive. That's why I got suckered in just like a number of other gamers who couldn't help but mention how good the art is in Ashes: Rise of the Phoenixborn. More games should be this colorful, this pretty, this diverse (seriously: there are five female Phoenixborn and only two males in the box. Even if you don't get the promo character - another female - you're still getting more ladies than gents. I didn't ask Fernanda Suarez, the artist, about this specific aspect when she signed my box, but I have to assume that getting a talented woman to create the artwork played a role. However it happened, it's awesome). While the subject matter is mostly standard fantasy tropes, it's all presented so cleanly that I can look past the fact that I've seen some of this before. Of course, I wouldn't bother writing about a game if the only thing worth mentioning is the pretty pictures. While the art got my attention, I stuck around for the game play. Ashes is a fighting game. But, for me, Ashes doesn’t feel like a bunch of attacks. Sure, your whole objective is to fight and put damage on your opponent’s main character, but the way the mechanics play out make the game feel more like a delightful puzzle than two wizards swinging swords or lightning bolts or voodoo puppets. I love card games because they often distill a set of possible actions into a finite set of choices. You can play this card or that card or you can trigger something on the board that you played earlier. Ashes fits right in there with some of my favorites because there are many possible options at the beginning of each round and you get to decide how you’re going to arrange them into the first, most important action and which one you’re going to try and the round end with (usually, but not always, it'll be an attack). Also, the way that players alternate turns means that you get to react immediately to whatever just happened. Is there an open space in your opponent’s battlefield? Guess it’s time to give her another Blood Puppet. Is an ally two points away from dying? Maybe I should use Blood Transfer and Living Doll to kill that creature. Or maybe I really need to make sure my opponent doesn’t have the dice to play another conjuration next turn, so I should use my Illusion die to remove a die from her active pool. Right from my first play, I could see that the decisions in this game were ones that were pulling me in interesting ways through the turn. Sure, my opponent is going to react and mess with things, but I had a road map. So, after a learn-to-play melee with five players (one who just read us the rulebook) on the Thursday of GenCon, I decided to try my hand in the first Ashes tournament on Sunday. I had a fun and successful game with the pre-built Jessa Na Ni deck on Saturday night, so I changed a few cards and went to bed. For the record, I took out one copy of the following: Redirect, Undying Heart, Cut The Strings, Blood Transfer and Final Cry. I put in Call Upon The Realms and Refresh from the Maroni deck, Small Sacrifice from Noah’s deck and two copies of Chant Of Revenge from Coal. I also played with six black dice and four pink ones after chatting with two friendly fellows at the tournament tables who suggested a 6/4 split before things got started. My first opponent was Carol from Singapore. She played an Aradel deck with the addition of Iron Rhinos. As I was still learning exactly how to make Jessa’s Blood Puppets work, these Rhinos were difficult to deal with, but in the end they were enough. As we were playing, the game's designer, Issac Vega, came by to personally thank all of the 32 players in the tournament. He seemed as happy as we were that the game was off to such a roaring start. The game was single-elimination and so I moved into the second round. This time, I faced a Saria deck (piloted by a guy whose name I forgot to write down. My apologies). It was a beast of a game, and it went right down to the wire. The first Ashes tournament used 50-minute rounds (I think) and we were both still alive when time was called. I had my swag (a free Ashes playmat), and didn't know if I had it in me to win another three games just for the chance at the full set, so I let my opponent win. This isn’t an empty boast. After we learned how the timed-out tiebreakers worked (if you were still playing when time was called, then whatever action was underway would be finished and then the winner was the player with the Phoenixborn with the most life left. If this was tied, then the winner was the one with the most cards left in his or her deck), it was clear that I would win. We were tied with one life left on our Phoenixborn, but my deck was taller at this point. Since it was the last day of GenCon and there were still sights to see, I reminded my opponent that he had a snake showing on his Charm die, and so instead of simply attacking my Phoenixborn as his last action, he could have pumped up his strength by one and kill me off. He sheepishly realized I was right, but this is the kind of puzzle that it takes time to learn with a new game like this. I let him take his move back, and he was happy to win. I was happy to take my free playmat and go about my day. We were all happy we got to play a great new card game, and in the weeks since GenCon, Ashes has become a fun side game to play after my regular LCG group's Netrunner games. I've taught it to a half-dozen people and they're mostly enjoyed it. 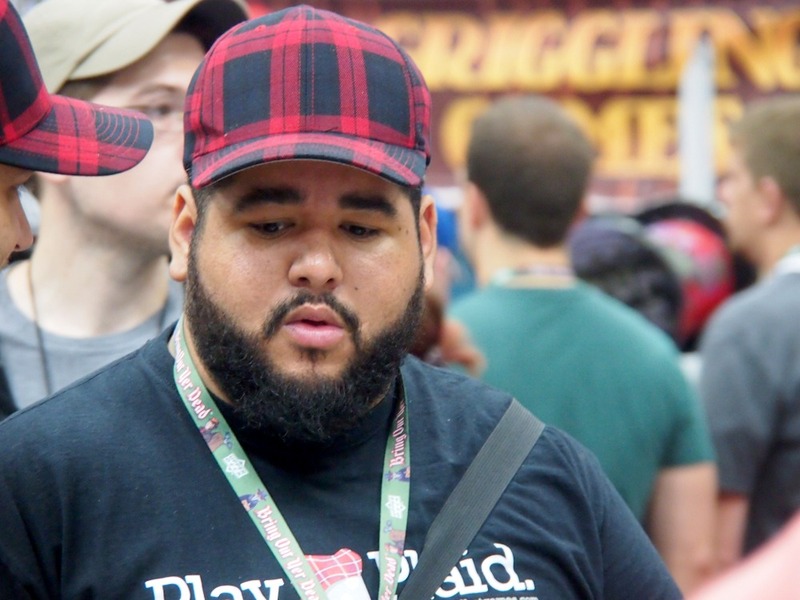 From these experiences and from reading people's thoughts about the game on Board Game Geek, I don't think it's a stretch to say that Plaid Hat has another hit on their hands. Whenever you can get me to drop $50 when I certainly didn't mean to do so, then you know something's up.